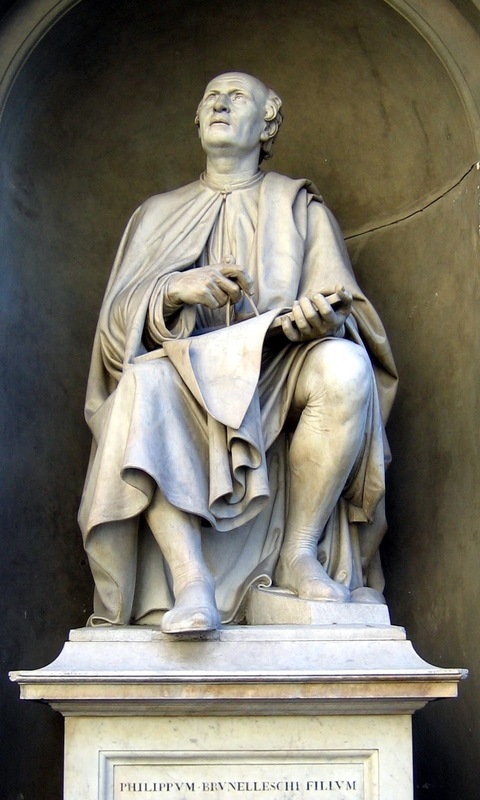 One of the founding fathers of the Renaissance, Filippo Brunelleschi, died on this day in 1446 in Florence. He is remembered for developing a technique for linear perspective in art and for building the dome of Florence Cathedral. However, his achievements also included sculpture, mathematics, engineering and ship design. 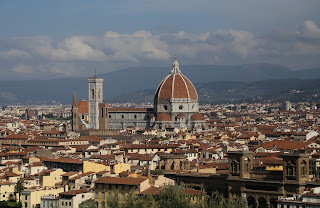 Brunelleschi was born in 1377 in Florence. According to his biographer, Antonio Manetti, and the historian Giorgio Vasari, his father was Brunellesco di Lippo, a notary. Filippo’s education would have equipped him to follow in his father’s footsteps but because he was artistically inclined he was enrolled in the silk merchants guild, which also included goldsmiths and metal workers, and he became a master goldsmith in 1398. In 1401 he entered a competition to design a new set of bronze doors for the Baptistery in Florence. His entry and that of Lorenzo Ghiberti are the only two to have survived. In the first few years of the 15th century, Brunelleschi and his friend, Donatello, visited Rome together to study the ancient ruins. It is believed they were the first to study the physical fabric of the ruins in any detail. 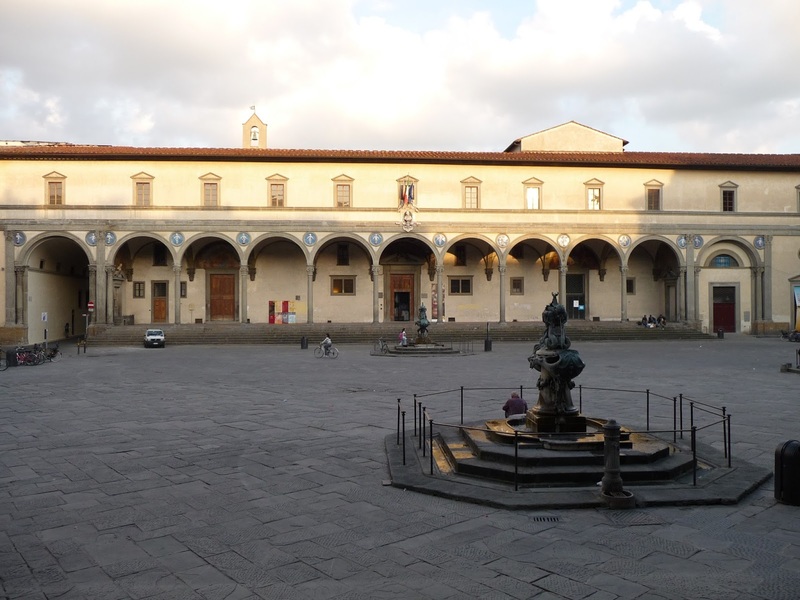 Brunelleschi’s first architectural commission was the Ospedale degli Innocenti, (Foundling Hospital) in Florence. It had a long loggia and impressive high arches. Later he used similar features in his designs for chapels in Florence. In 1418 a competition was held for a design for the dome of the new cathedral in Florence, Santa Maria del Fiore. The original designs made provision for a dome when building began in 1296 but no one had been able to work out how to construct one on such a scale. Again the two main competitors were Ghiberti and Brunelleschi, with Brunelleschi winning and receiving the commission. The dome was to take up most of the rest of Brunelleschi’s life and its success has been attributed to his technical and mathematical genius. 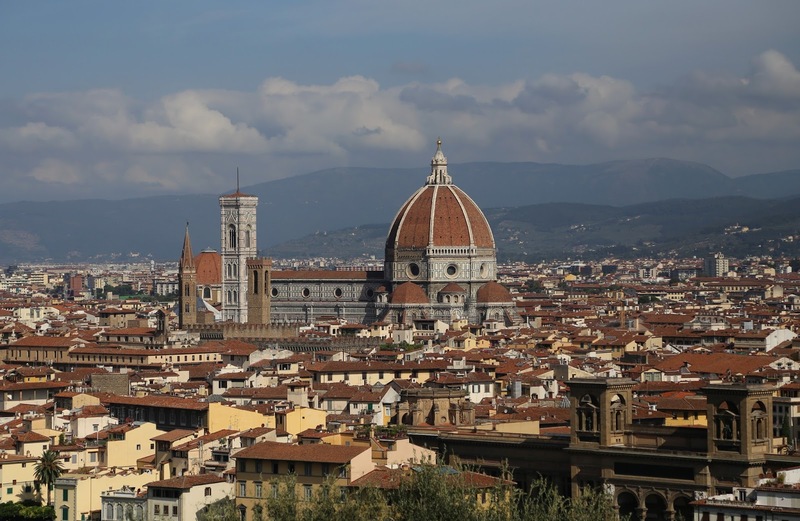 Hence it became known as Brunelleschi’s Dome. He used more than four million bricks in the construction and invented a new hoisting machine for raising the masonry to the dome, inspired by Roman machines used in the first century AD. 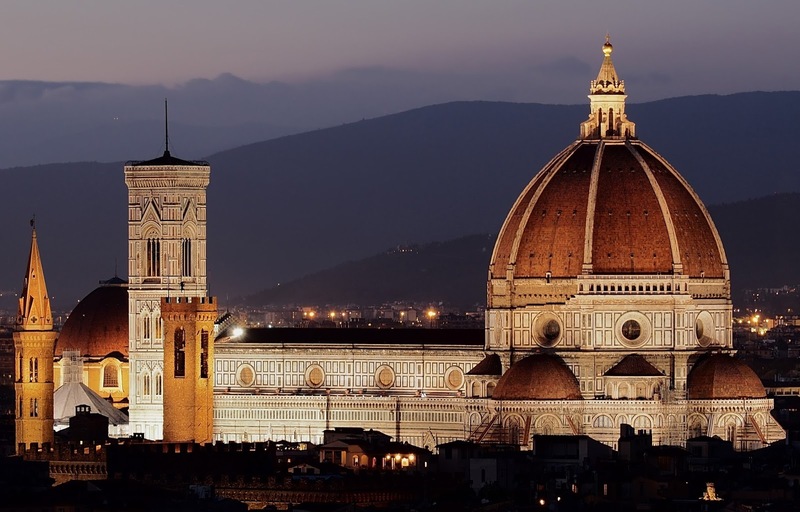 Brunelleschi’s Dome was finally put in place in 1436 and the Cathedral of Santa Maria del Fiore was consecrated by Pope Eugene IV on 25 March that year. The dome remained the largest in the world until others were constructed using new materials that had been developed for building in modern times. But Brunelleschi’s Dome, the first in history to be built without a wooden frame, is still the largest brick dome ever constructed. 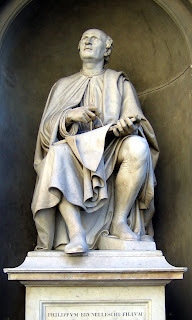 The sculptor Luigi Pampaloni created a statue of Brunelleschi in about 1838, placing it in Piazza del Duomo in a position from which Brunelleschi appears to be looking up at his work. 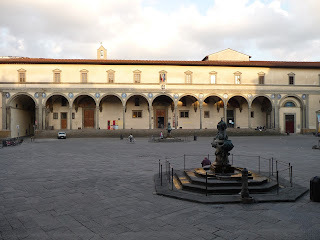 The Ospedale degli Innocenti, literally Hospital of the Innocents, is a magnificent building that still stands in Florence. Brunelleschi was commissioned to design it in 1419 and it is now regarded as a notable example of early Italian Renaissance architecture. The loggia with its nine semi-circular arches faces on to Piazza Santissima Annunziata, a square that is not far from Galleria dell’Accademia, which houses Michelangelo’s sculpture of David.